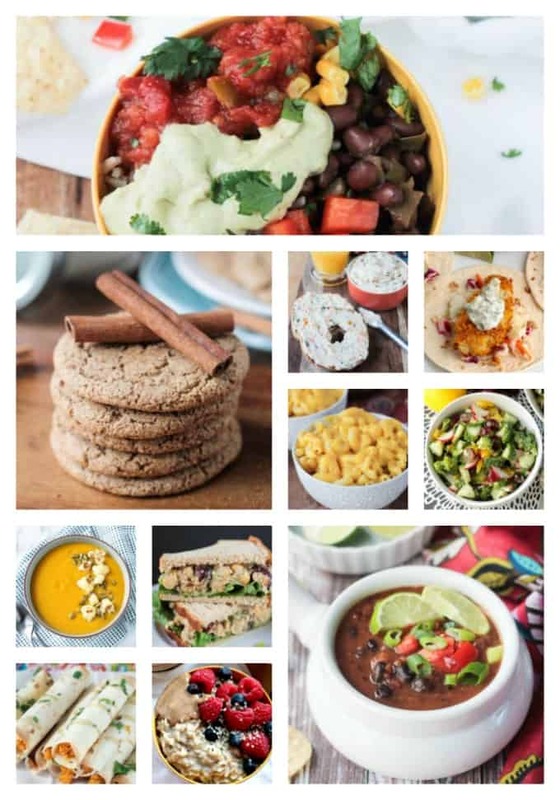 Tasty Vegan Recipes – Reader Favorites! The Best Vegan Recipes! ~ From breakfast to dessert and everything in between, these are the recipes that YOU readers have dubbed the Best Tasty Vegan Recipes! These Tasty Vegan Recipes are tried and true! These are the recipes that readers have viewed the most and feel compelled to comment on after making them and loving them time and time again. Try them for yourself – you don’t want to be missing out on this deliciousness! And then please spread the plant based love by sharing your favorites on Facebook, Instagram, Pinterest, or Twitter! Here are the all-time Top 15 Tasty Vegan Recipes from Veggie Inspired. 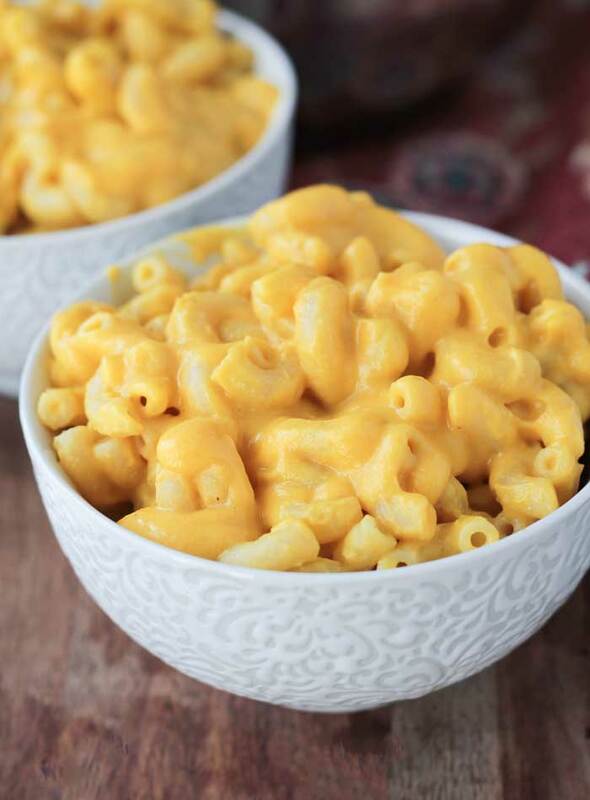 Butternut Squash Mac and Cheese ~ The PERFECT vegan mac and cheese! You will not believe how good this is!!! No soy, fake cheese or nutritional yeast. Crispy Baked Cauliflower Tacos ~ The crispiest cauliflower you’ve ever had…and it’s BAKED, not fried! 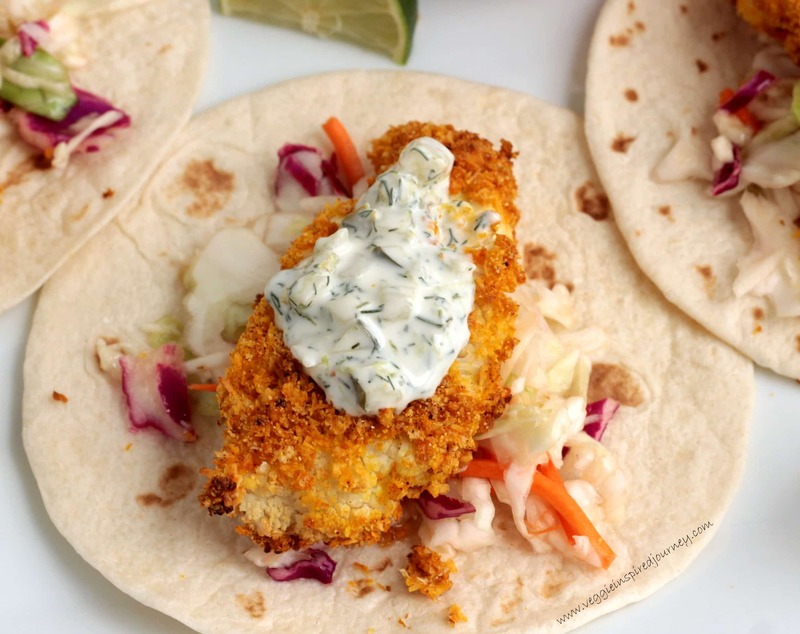 Crispy, crunchy, creamy – you can have it all with these tacos! Super Simple Burrito Bowls ~ So quick and easy it takes less than 20 minutes! Make this your go-to weeknight meal in a pinch! Cinnamon Sugar Cookies ~ perfectly chewy, sweet, and packed with warm cinnamon. Only 6 ingredients and 15 minutes needed to make these quick and easy, gluten free cookies! These cookies are one of my most re-made recipes on Instagram too! Love seeing all of your photos! 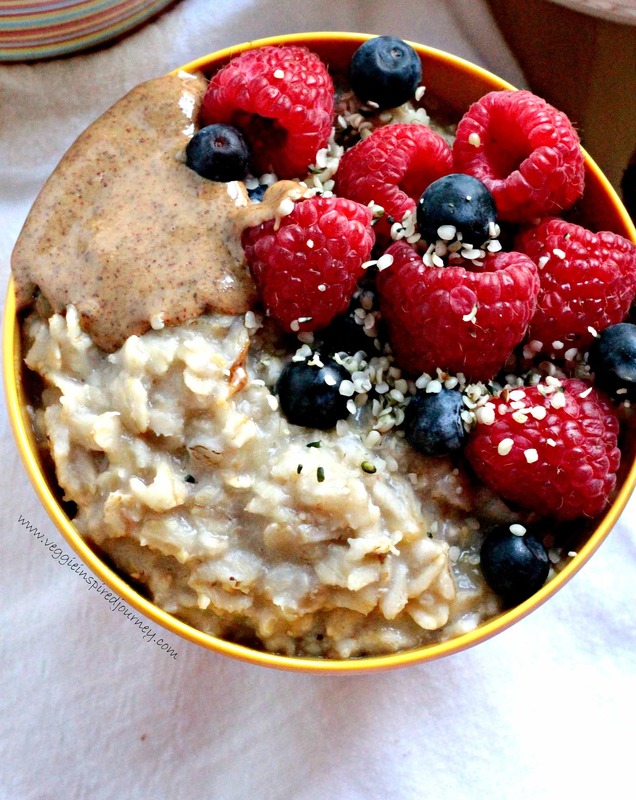 Customizable Healthy Oatmeal ~ Healthy Oatmeal that’s super creamy, perfectly sweet, and totally customizable with absolutely no added sugars! 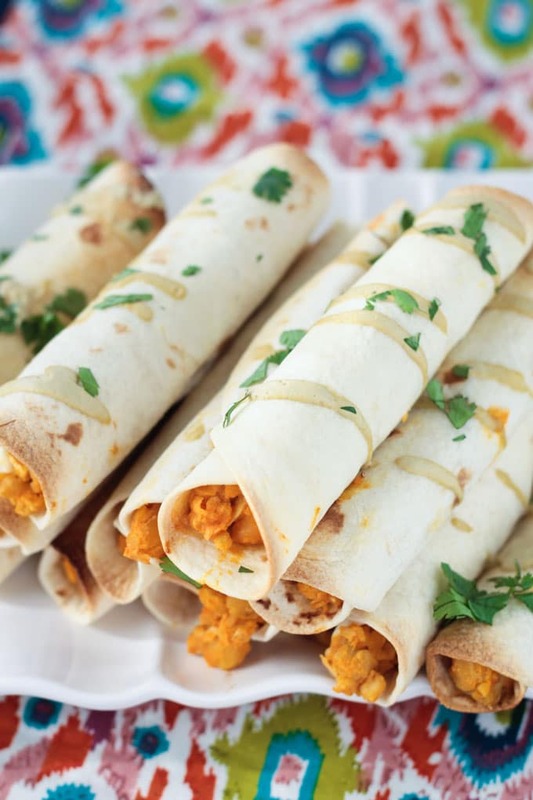 Baked Buffalo Vegan Taquitos ~ a delicious, creamy, spicy snack for game day, parties, or anytime. Easy to make them as spicy (or not) as you want them. They make a great lunch or dinner too! 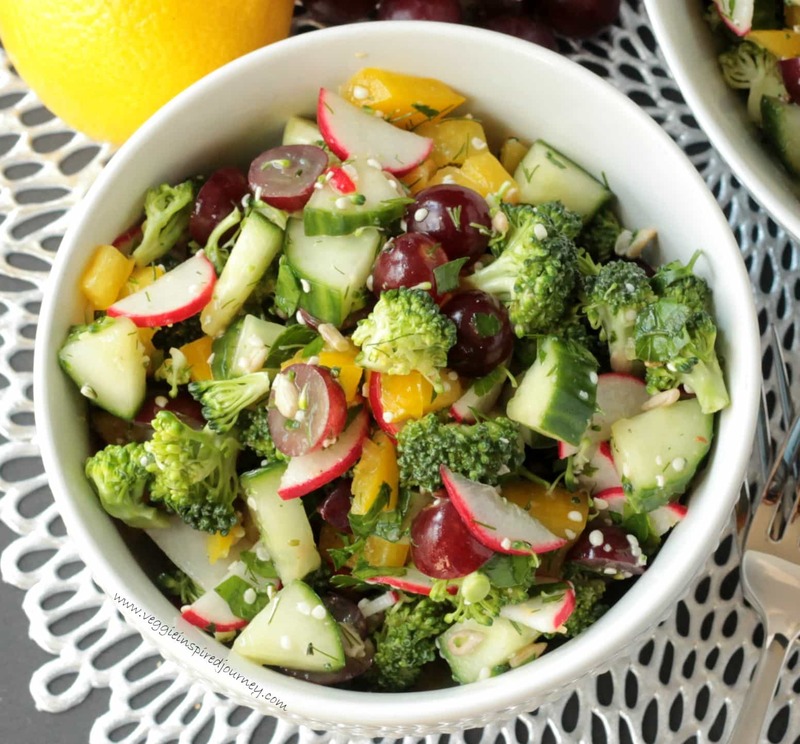 Raw Veggie Chopped Salad ~ perfect for summer parties, potlucks and BBQs. Full of flavor and no lettuce needed. You can easily double the recipe to feed a huge crowd. 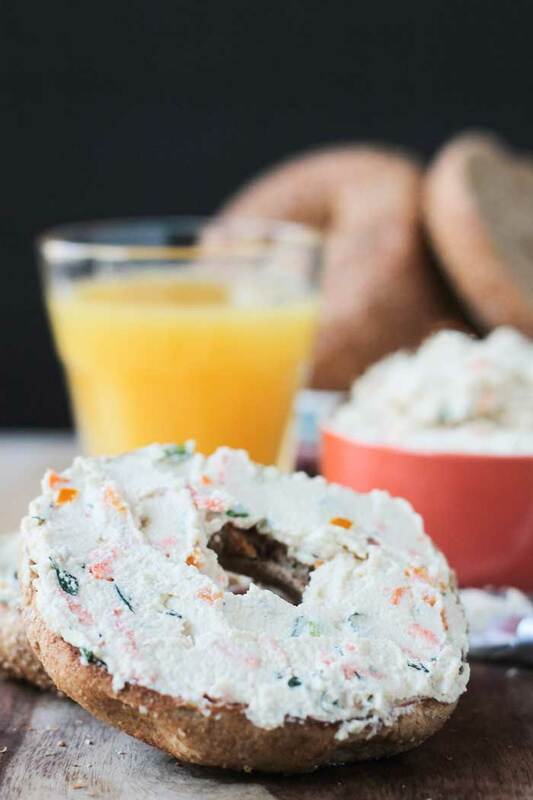 Veggie Cream Cheese Spread ~ Creamy and tangy with diced fresh veggies throughout, this dairy free cream cheese is perfect on bagels or toast, as a spread in sandwiches or wraps, or as a dip for crackers or raw vegetables. Black Bean Taco Salad ~ quick and easy, but full of flavor and texture! The perfect summer weeknight meal. Creamy Cumin Ranch Dressing ~ A creamy, tangy, herby, dairy free ranch dressing with a hint of southwest flavors. 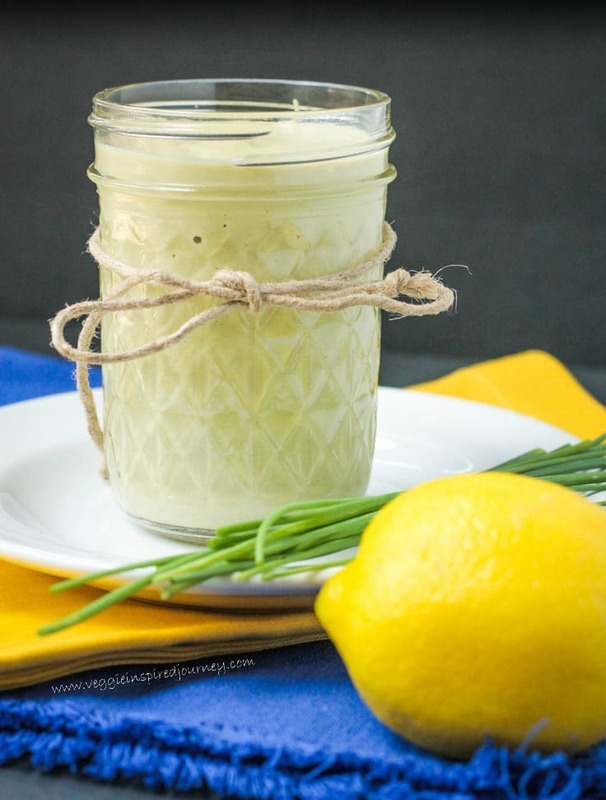 This dressing is super versatile! Try it on salads, burgers, baked potatoes, stirred into soup, as a dip for raw veggies or french fries…the possibilities are endless! 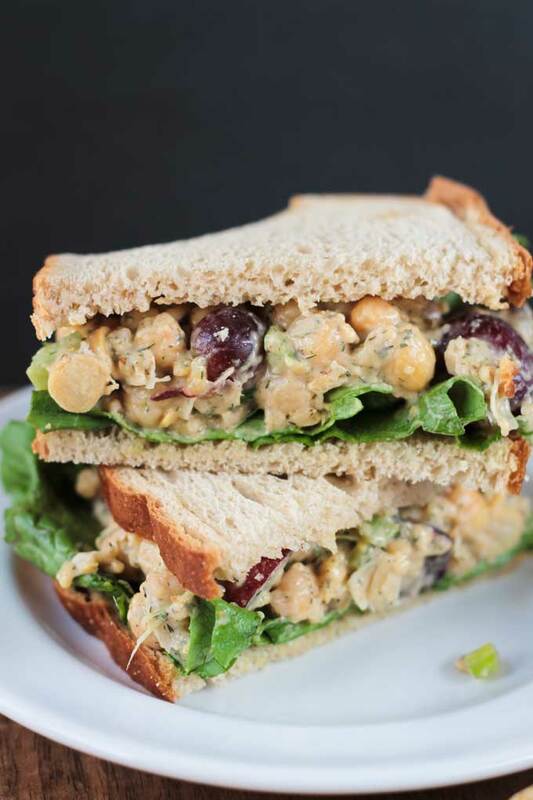 Vegan Chickpea Salad ~ This Vegan Chickpea Salad recipe is quick and easy and makes the perfect lunch or snack. Load it up between 2 slices of bread, on a cracker, or over lettuce as a salad. It’s always a huge hit! Cinnamon Chickpea Blondies ~ Healthier blondies that are moist and tender in the center with a bit of a crackly crust on the top. High in protein, fiber, iron and folate! Gluten free, dairy free and oil free! 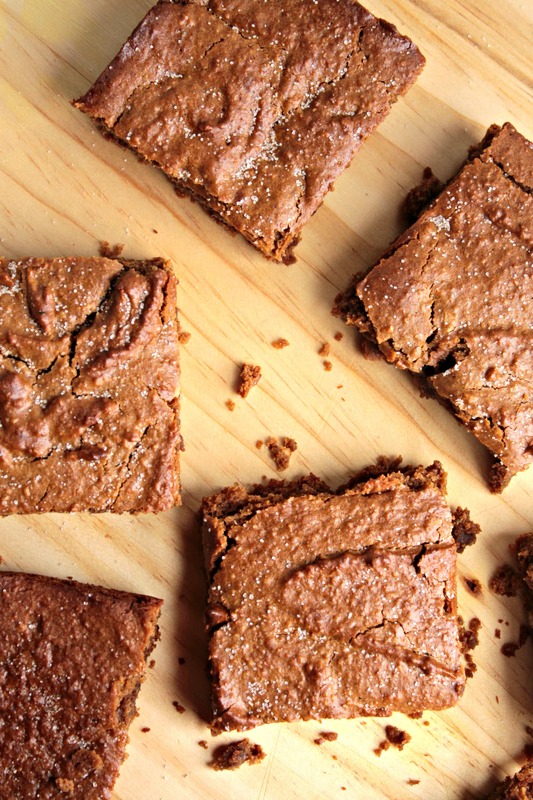 You might want to make a double batch because these dreamy blondies are addictive! 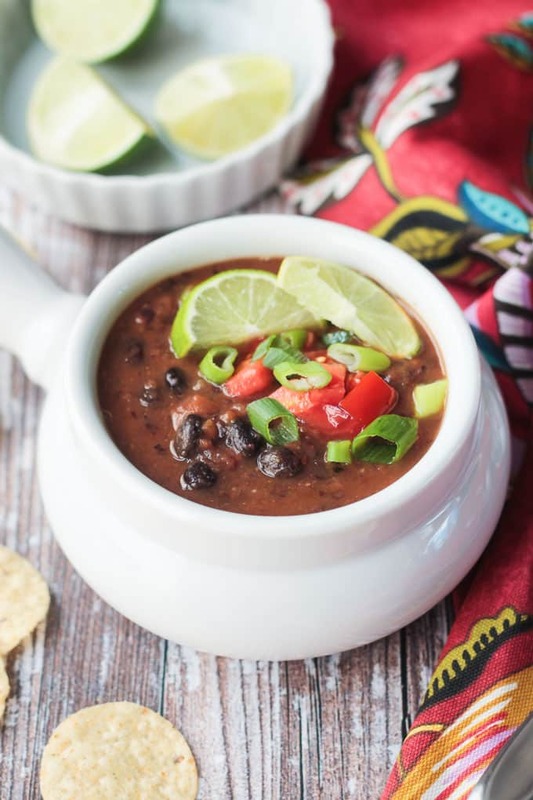 Simple Black Bean Soup ~ Packed with hearty plant based protein, vegetables and spices, this quick and Easy Black Bean Soup is perfect for a cozy weeknight meal. 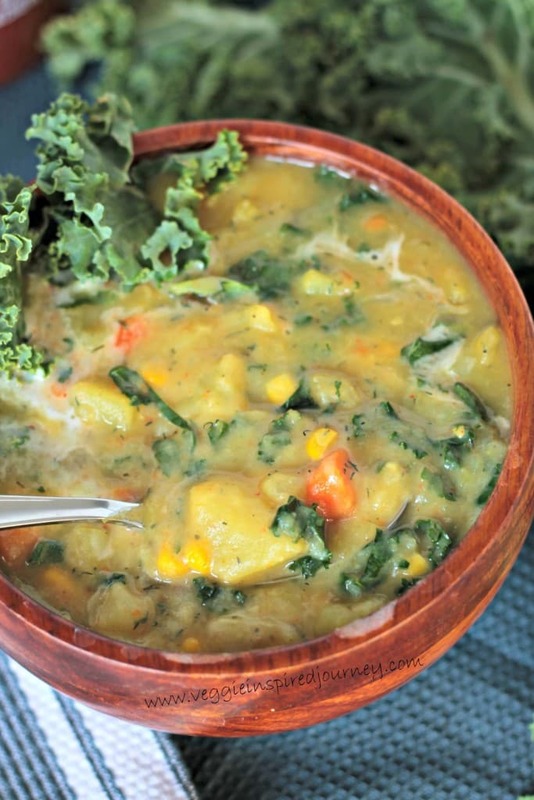 Creamy Dairy Free Potato Soup ~ A thick, creamy, hearty and delicious dairy free Potato Soup loaded with veggies. Grab a spoon and dig in! 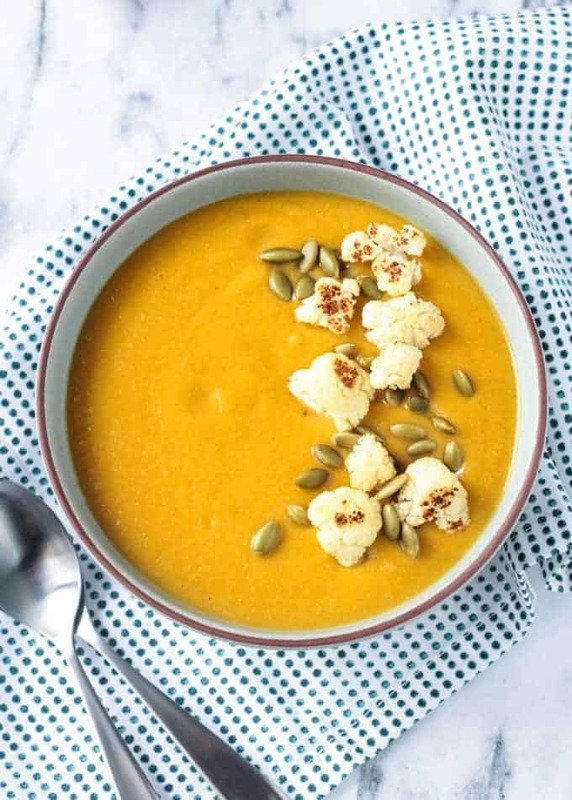 Sweet Potato Cauliflower Soup ~ Sweet Potato Cauliflower Soup – a creamy vegan soup made with whole food ingredients and minimal fuss to let the vegetables shine. Perfect for a weeknight. So there you have it. The top 15 reader favorite vegan recipes! Have you tried any of them? If so, please let me know in the comments below or leave me a comment with your feedback and star raring on the recipe post itself. Did I miss any? What’s your favorite Veggie Inspired recipe? This is a true testament to how delicious vegan food can be. Love it! Yes! So tasty! And so much variety! Thanks, Linda! All of the raves don’t surprise me – your recipes are delicious Jenn! Are there any reader favorites that have surprised you? I know I’ve been surprised by a few of the most popular recipes on my site. Yes! Although, it didn’t make this list, my Black Bean Zucchini Enchiladas are a huge hit with readers. I wasn’t even sure I should post that one because it’s soooo not traditional. But it IS delicious and people like delicious! What a smart idea! some of your best recipes all in one place! Love it! I’ve made your veggie cream cheese so many times. So delicious! Oh yay! I didn’t know that. So happy to hear you love it! Thanks, Vanessa! Oh, my gosh. I want to eat every single one of these – from top to bottom. But the one I want the MOST are those baked cauliflower tacos. Whenever I see them on Pinterest, I feel immediately hungry. HaHa, yes, those are a favorite in our house too! Thanks, Cadry! I’ve made a few of these recipes (the tacos and the cream cheese), so I can attest to their deliciousness! I’m looking forward to trying the others! That’s awesome to hear, Dianne! Thank you!